A recent U.S. prosthetics practice survey revealed that upper-limb prosthetics represents only 5-percent of work performed by prosthetists nationwide. One might conclude that since research efforts and dollars tend to be spent in a similar proportion, the needs of arm amputees could be overlooked in favor of larger groups such as leg amputees. 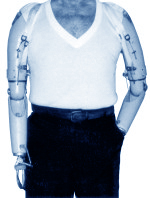 Conversely, this is a very exciting period for arm amputees in search of a better prosthesis. New technologies such as batteries, microcomputers, small but sturdy circuit boards, and other electronic advances allow greater function than ever before. And new materials such as composite plastics, silicones, etc., are creating lighter-weight designs and more natural-looking cosmesis for both adult and child upper extremity amputees. Media attention is drawn to “high-tech” devices such as myoelectric arms, but progress also continues in body-powered developments. The future will reveal even more advancements in body-powered devices, offering the benefits of lower cost and simplicity.